Welcome to Chiropractic Health Clinic of Sparta! 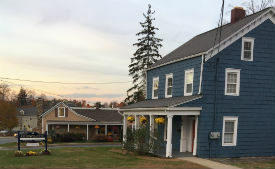 We are located at 33 Woodport Road in a blue building next door to Gentle Dentistry — across the street from the Mohawk Avenue School and the Sparta Library, and before the jug handle. Get off at the first Sparta exit (Sparta Business District). When you get off stay to your right; you’ll be on Woodport Road. About 1.5 miles down the road we’ll be on the right-hand side. Coming from Newton, go down 517. Make a right on 181. Then make a right when you get to Woodport Road. We are less than a quarter of a mile on your right-hand side.